Slow growing ornamental grass with mounds of gently cascading blades. The color is green with thin white stripes running the length of each leaf. With cooler temperatures, some pink tones appear. 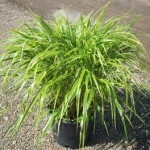 It performs best in shade with moist soil. It may be divided in early spring into small divisions. Combines with ferns and hostas, as they have similar requirements.